Thermaltake was once known only for its chassis and cooling products, but over the years, the company’s branched out tremendously. Through its Tt eSPORTS brand, it caters to those who take their gaming seriously. 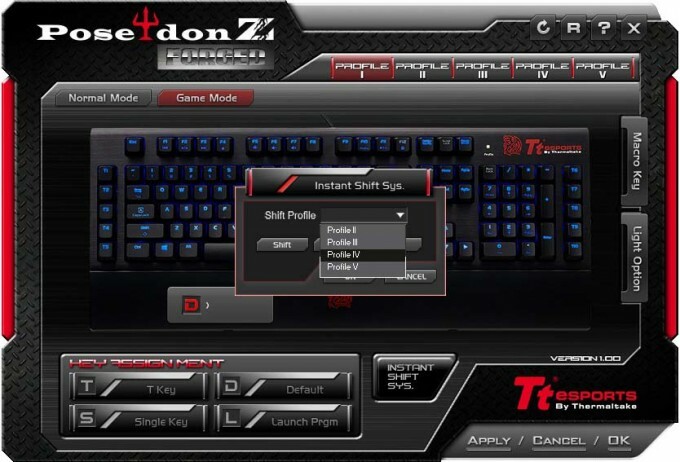 On the test bench today is a perfect example of a “serious” gaming peripheral: the Poseidon Z Forged keyboard. Here at Techgage, we have reviewed many of Thermaltake’s devices, and overall, they have been very consistent. The company started out as one that specialized in chassis and CPU cooling, and it made waves – it offered high-quality components (and good-looking ones, in many cases) at competitive prices. From there, it pivoted to offer many more products, rich with features and value. Today, Tt offers a very wide latitude of products, from power supplies to cases, storage accessories to fan controllers, and even has a mobile division called LUXA2 that offers many diverse solutions for the mobile lifestyle of today’s consumer. 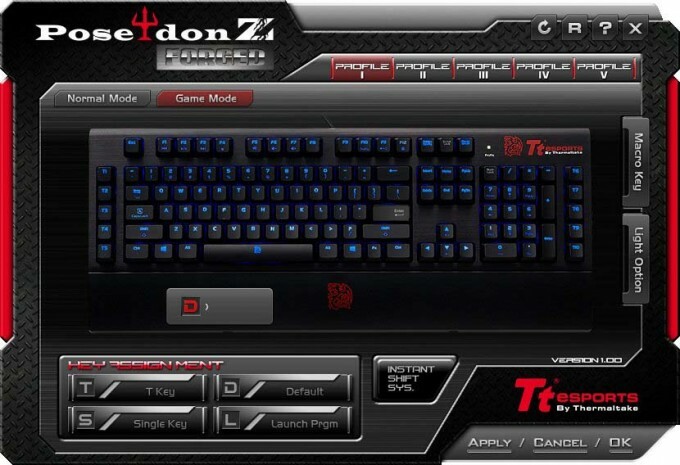 Here in this review, we are going to focus on the company’s gaming accessory division, dubbed Tt eSPORTS – more specifically, the mechanical backlit gamers keyboard, the Poseidon Z Forged, “Blue” edition. As I have mentioned in reviews passed, keyboards can be very challenging to review. They are very personal items, and everyone has different expectations and preferences. My job as your humble reviewer is to decipher what you as the reader would want to know about this keyboard, and to deliver that, and only that. Having said that, let’s move forward and take a look under the hood of this peripheral. The initial appearance of this keyboard follows a mantra that I personally enjoy – less is more. There are keyboards out there with wicked lines, odd shapes, and unusual characteristics in general. Some consumers enjoy this aesthetic, as some like the way it follows the “gamer” look – akin to something out of a science fiction movie. You won’t find any of that on this plank – all clean lines and very consistent from one end of the board to the other. This keyboard does offer adjustable backlighting, and it is a VERY handsome blue that not only illuminates the keycap letter/number, but also the gap around the keys, giving it a real “pop”. The layout of the keyboard is standard – all keys in rows, no singular loners, no buttons, all regular keyboard switches, no knobs or rocker switches, a very consistent layout. Personally, I really like a volume knob on my keyboards, as I find it much easier to control my speakers or headphones that way, but a keyboard not having that is certainly not a detractor, in my opinion. On the far left and right hand sides of the keyboard, there are a total of 10 programmable keys. This is probably the only major issue I have with this keyboard’s layout – on the far right hand side at the end of the board, the 5 programmable keys. On every 10-key keyboard I have ever owned, or at least that I can remember, the last button on the far right hand lower corner of the keyboard was the enter key. I find myself often making the mistake on this keyboard that the enter key is in that same spot, when it in fact is not, as I use my 10-keys often. This is not a major deal, but it is something to consider when choosing keyboards. I look at keyboards more from a pure typist perspective, and this key placement is less-than-ideal for a typist, but gamers may love the fact that they can instinctively find the far right hand side of the keyboard without taking their eyes off the screen to hit those important programmed macros or hotkeys. One really slick feature of this keyboard is the removable, magnetically attached wrist wrest. Some keyboards have non-uniformly shaped wrist wrests, something that I personally don’t care for. I like wrist wrests just like this one – straight across, level, easily removed, but still attached strong enough that it won’t separate unintentionally. The magnetic coupling system also means that you can attach and remove it an infinitesimal number of times and it will still function as well as it did the day you took it out of the box. This is opposed to other makes of keyboards where the wrist wrest is either non-removable or is attached by plastic snapping together in one way or another, which offers a finite number of actuations before it breaks, wears out, or just becomes sloppy. You may not deem this particular spec as all that important, but it is this kind of attention to detail that I really love in a product, and deem it worth mentioning. The top of the keyboard is capped with a thick piece of brushed anodized aluminum, which is a really great touch as it gives this keyboard just as solid of a look as it does the feel. Not only does it give a solid look, but also a space-age super modern, cleanliness only machined metal can give. You almost have to see this in person to truly appreciate the way this looks. On the backside of the keyboard you find well-made flip-up feet to adjust the tilt of the keyboard. There are a total of 5 non-slip feet on the bottom of this keyboard; whether you have the feet flipped up or down, this is yet another detail Tt paid extra attention to. The cable is a very thick, woven mini-USB on one end, and standard USB on the other. The cable is removable, which is a feature I tend to not care for, but the way it fits into the chassis and is securely held in by the channels, I don’t mind, as this will not be easily unplugged by accident. The cable channels on the bottom of the chassis give you 5 different possible configurations for the routing of your cable, thus accommodating nearly every possible desktop scenario that you can think of. If you want to take full advantage of everything this keyboard has to offer, you will want to install the accompanying software. 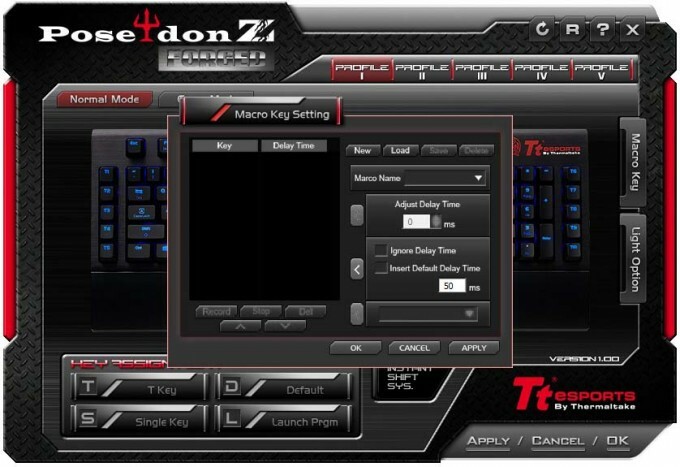 With this software, you can change the illumination of the keyboard, assign macros, and create different profiles to make different keys do different tasks, depending on the profile that you select. Here you can also enable the ISS, or instant shift system. This will allow you to quickly change profiles using either the Shift, Ctrl, or Alt key – giving you access to all 100 macro keys very quickly. The software works as expected, but it did require a reboot after installing which was a disappointing inconvenience in this day and age. One notable feature of this keyboard is its onboard DAC amplifier – in effect a sound card that will be detected by the OS. 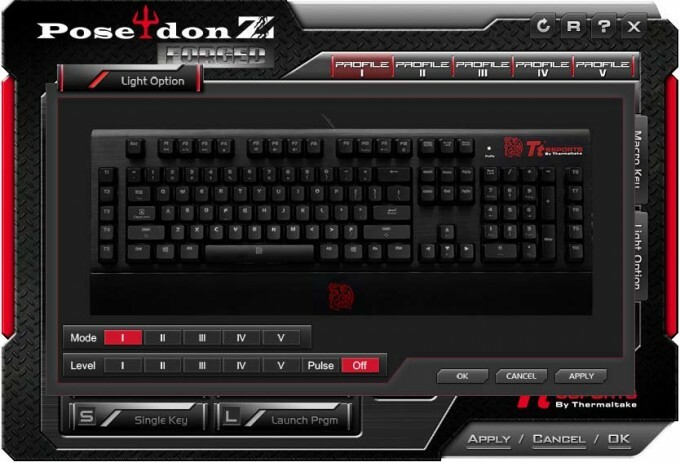 This is not likely going to get much use by most owners of the Poseidon Z, but it could be useful for gamers who are at a LAN (or even in competition) and would rather plug their headphones into the keyboard rather than at the back of the PC. However, when you consider that your long headphone cable is going to be hogging up desk space and potentially getting in the way, it’s easy to see why the feature has limited use. But, at least it’s here for those who do want it. The Poseidon Z Forged is offered in two flavors – with Blue and Brown switches. You might assume, just as I did, that this meant that the keyboard offered the industry standard CHERRY brand switches, in the two most popular designations for typists. Not so – not even when you pop a key off and think it looks like a CHERRY switch. The brand switches in this keyboard are Kailh. This isn’t the first plank we’ve looked at with Kailh switches, but it is the first one I’ve personally been able to test. These switches have a different actuation force than the CHERRY brand ones, but other than that the specs are very similar. They have a nice premium feel, but I have read other users noticing an inconsistency in this switch in other brands of keyboards. 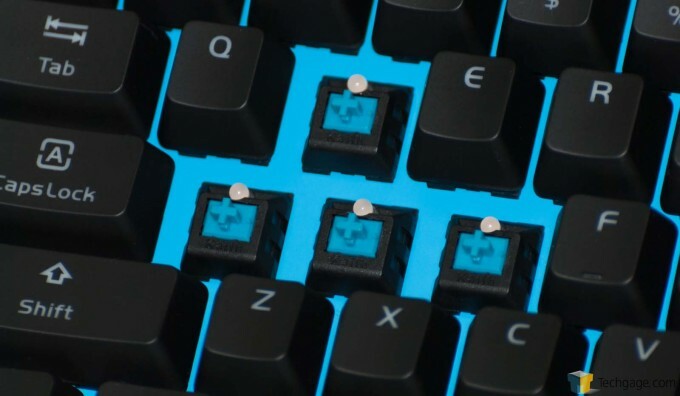 Tt labels these as Tt Certified Switches, and offers an industry first for mechanical keyboards: 5 years. That is how confident Tt is with this switch. Upon inspection, they look like a CHERRY, sound like a CHERRY, and to me, even feel like a CHERRY. CHERRY is known for very consistent, German manufacturing quality. Some purists may frown on the choice to go with Kailh switches, but with Tt offering a 5 year warranty, these switches certainly seem to be a viable contender in the mechanical switch market. The keyboard types very well. I have been using this for several months now as I wanted to be certain of the quality of these switches before I reviewed them. I am somewhat heavy-handed, and I type at my job pretty much all day. I ran into no problems with this keyboard whatsoever. 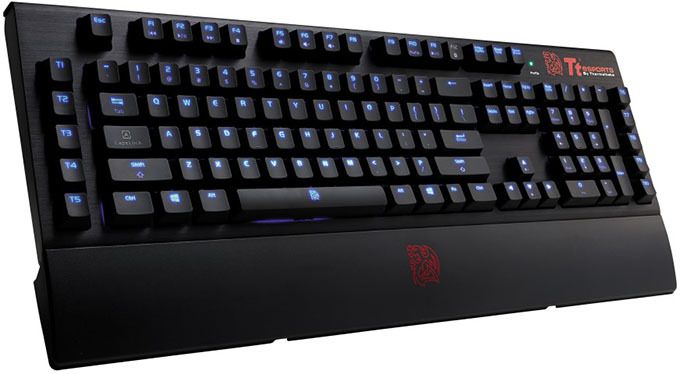 I have used other keyboards with CHERRY Blue switches before, and these feel very much the same, so much so that if I were to test them blindfolded, I would likely not be able to tell them apart. The keycaps have flush lettering, and are smoother than most keys out there, but are textured enough that I didn’t find my fingers sliding off them (unless I was eating a Hot Pocket at the time). As I mentioned before, I do not care for the programmable keys being on the far right hand side of the board, as I found myself constantly hitting the T10 button instead of the enter button; it slowed me down in the beginning using the 10 keys altogether, but I eventually got used to it. Overall, this is a great keyboard, and with the omission of the CHERRY brand it certainly helps keep the keyboard at a modest price point (~$110). Unfortunately, I feel like it could be even less expensive if the audio feature was removed – it just doesn’t strike me as a feature that will be used by too many. 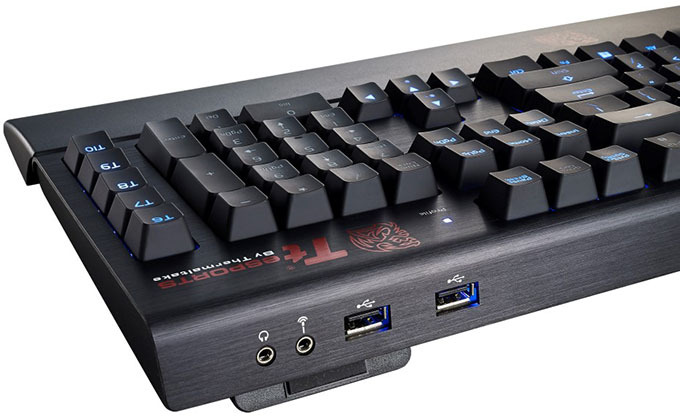 The thick aluminum shell that covers the top of this keyboard really makes it feel and look fantastic, and for its price point, depending on where you shop, it is very competitively priced. Some might shy away from it simply because the name CHERRY is not on it, and that is understandable as you want to stick with what works. However, I would recommend giving these Kailh witches a try, as I think you will not be disappointed. 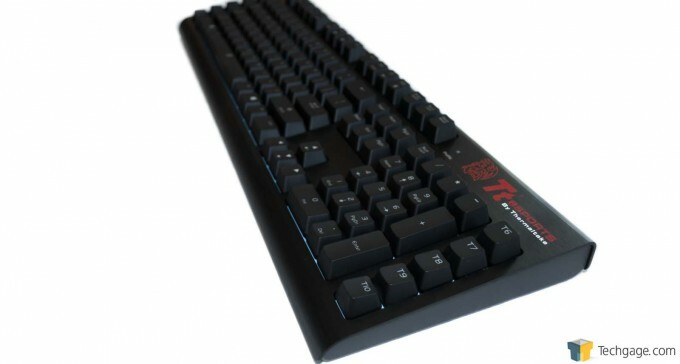 Tt has really put its muscle behind them with the 5 year warranty – an impressive offering for a mechanical keyboard.